"There are Occasions when a Taxi is the Best Way to get Around. Find out What You Need to Know About Lake Garda Taxis"
Sometimes a Lake Garda taxi is the most convenient way to get somewhere, especially if you need to get there fast. 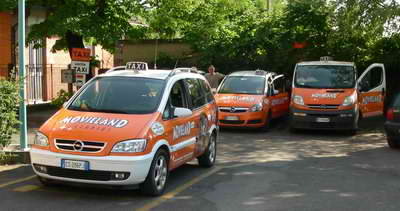 We have used taxis before getting from the railway station to our hotel and to go out in the evening. There doesn't seem to be any one particular company operating around Lake Garda; most taxis seem to be independently run cars. Look in local telephone directories or ask the local people at your hotel or villa when you need to book a taxi. In our experience, the taxis there are quite expensive and so you may want to use public transport where ever possible. As is common here, a bit of haggling never does any harm and it can often save you a Euro or two! Always agree a price for the trip before you set off so you know what the cost will be in advance and this way the driver can not make up a figure at the end. If you do not speak Italian and have not been to Lake Garda before then the proper pronunciations of the local towns may be quite a bit different to what you think! It is common for taxi drivers here to look puzzled as tourists try and tell them where to go, as they say a place name incorrectly. If you are not sure how to say a place name, my advice is to write down the name of your destination, or better still, have a computer printout with the exact address and map, if possible. You will often find Lake Garda taxis at the train stations but, unlike other countries, do not expect there to always be a long line of taxis waiting to greet you. I remember waiting quite some time at Peschiera train station for one to appear. As is true in most places, you are more likely to find a taxi at major transport links, town centres and tourists attractions.